Last week on “How to Run a Food Truck,” we covered one of the most important topics we’ve ever written about here on FoodTruckr—how to deliver excellent service to your customers. 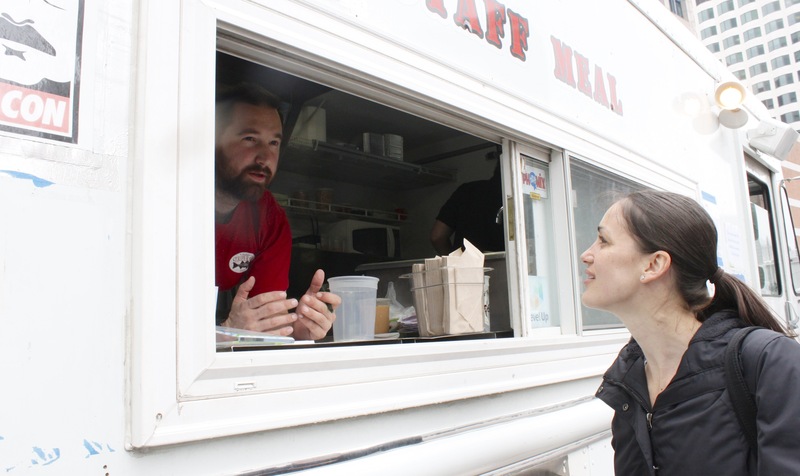 Good customer service is the foundation of every successful business, and our FEAST Experience model is the best way to ensure that you and your food truck team members consistently adhere to high service standards. Satisfying your customers is the single-most valuable thing you can do as a business owner—but you also need to realize that not every customer will be happy with your food, your service, and what you have to offer. Though you shouldn’t take their dissatisfaction personally, you should care deeply about how they feel and about whether or not you could have done something to serve them better. When a customer is unhappy, it’s up to you to take charge of the situation and to do your best to resolve his or her complaint. In today’s all new lesson, we’ll show you another convenient tool you can use to resolve customer complaints and to prevent similar situations from occurring in the future. It’s called the LEARN model—and we think it’s a great way to deal with unhappy customers and to reflect on any mistakes that were made. These five steps are the best way to deal with a customer who has a valid, founded complaint—and it can even work with customers who are being a little unreasonable. However, we don’t recommend bending over backward to help customers who are being offensive, abusive, or otherwise unnecessarily rude to your employees. If someone is demeaning your team members, it’s important to stand up for your employees and show them that you value their contributions to your truck just as much (if not more than) you appreciate the customer’s money. The LEARN model as a whole also can help you reflect on mistakes your team may have made and find ways to prevent them from happening again in the future. As you use the LEARN method on your truck, keep in mind that this tool is a convenient and effective way to manage disputes and improve your food truck’s customer service policies because it allows you to stop and focus on what went wrong and how you can correct the issue moving forward. Okay—now that you’ve got a better idea of the basic ideas that form the foundation of the LEARN model, let’s get down to business by exploring the very first step: listening! Sure, you’ll hear about it when a customer has a problem—but are you really taking the time to listen to the customer’s complaint? When customers are upset about something they’ve experienced, they sometimes complain because they want a resolution—and they sometimes complain simply because they want someone in a position of authority to know what happened and to admit wrongdoing. In cases like these, the actual way you choose to fix the situation may not matter as much as the fact that you took the time to listen to what the customer had to say. A new fan, Alice, stops at your food truck for the first time. Alice doesn’t have any food allergies, but she is trying out a new gluten-free diet and wants to know about the ingredients in your taco salad. She asks your team member, Bob, about how the beef in the salad is processed and if any of the other ingredients in the salad have gluten. He checks and lets her know that the meat is fine and wholly gluten-free, that the tortilla chip strips are made of corn, and that all of the other ingredients in the salad are natural and totally safe. Alice happily orders a salad and pays. Bob said he was sorry, but that didn’t seem to be enough for her—Alice is still angry and is starting to make a scene in front of other customers. You come to the window to see what’s going on and Bob relays the story to you. Sure, he gave her the wrong information—but since she’s only on a gluten-free diet and doesn’t have a food allergy, is it really that big of a deal? Yes, it is. Though the gluten in the salad dressing wouldn’t have affected Alice negatively in the same way that it could endanger someone with Celiac disease, Alice still relied on what Bob told her in order to make an informed decision about what she was eating—and he gave her the wrong information. And in this case, Bob didn’t make the mistake by switching up the order or by giving Alice the wrong side. He made a mistake by not checking all of the ingredient information thoroughly enough to see that the salad dressing had gluten products in it. In the grand scheme of things, this mistake might not matter much to Alice and her new gluten-free diet—but the oversight could have had serious consequences for someone who had a real food allergy. Now imagine that you are the food truck owner in this situation and you’ve just come to the window or stepped outside the truck to talk with Alice. Before you do anything else, you need to listen to what she has to say and figure out why she’s upset. Though you might be able to anticipate why she’s angry before you’ve talked with her, you still need to give Alice the chance to vent and to express her feelings about what happened. You May Also Like... #FoodTruckFan: What Makes Food Trucks So Special? As you listen, you learn that Alice isn’t just upset because Bob gave her the wrong information—she’s upset because his carelessness could have had a dangerous impact on another customer who was more sensitive to gluten. Because Bob only apologized briefly and didn’t do anything besides offer her a different type of salad dressing, Alice is also now upset because she perceives your truck as apathetic and incompetent. You allow her to get all her feelings on the subject out at once. You learn exactly what happened from her perspective. You show her that you care about what she has to say. You get time to formulate a response and to come up with an appropriate action plan. Once Alice has finished complaining and is ready for you to come up with a solution, you can move on to the next step of the LEARN model—empathizing. So—Alice is upset not just because she received some salad dressing with gluten in it when she didn’t want gluten, but also because she’s afraid that your truck isn’t taking people with gluten sensitivities seriously. She’s concerned that someone with a real allergy to gluten could have been so easily exposed to dangerous ingredients because your team member, Bob, wasn’t being careful enough. And she’s mad that Bob didn’t act like it was a big deal when she pointed out the mistake to him. Now that you’ve listened to Alice’s complaints and you can begin to see why she’s upset, it’s time for you to empathize with her. Let Alice know that you understand why she’s angry and that you can relate to how she feels. The trick here is to let Alice know that you’re on her side by showing that you can relate and that you understand why she’s upset and how she feels. Though Alice will probably still be pretty upset at this point in the interaction, your empathy will make her feel heard and valued—and if all goes well, it will help her start to calm down a little. After connecting with Alice and letting her know that you understand her position, it’s time to apologize for your truck’s mistakes and take responsibility for the situation. Sometimes this step and the previous step can go along together very easily, but we do recommend making your apology as separate and clearly defined as possible. You need to let the customer know that not only do you understand why he or she is upset, but that you also are acknowledging that what your truck did was wrong and that you’re committed to preventing similar mistakes from happening in the future. Apologizing clearly and using language that admits fault like the sentences listed above will make the customer feel better and as though you’re taking responsibility for the situation. In Alice’s case, you’re admitting that your truck messed up and that it was unacceptable that she received something containing gluten products after specifically expressing her dietary needs. The direct apology shows Alice that you aren’t trying to hide from the mistake and that you are willing to take responsibility for your truck and your employee’s actions—and, most importantly, that you feel bad about the inconvenience and distress you caused her. After you’ve heard the customer out, empathized with his or her plight, and offered an apology for your truck’s mistake, it’s time to move on to the fourth and perhaps most important step of the LEARN model—resolving the situation. Empathy and apologies are essential and can be quite valuable to the customer, but many dissatisfied people are also looking for resolutions to their problems. A resolution can take any number of forms depending on what the customer’s problem is, how he or she was affected, and how dramatically your truck messed up. You’ll have to use your best judgment in each situation, but in general, resolutions should be based on how much trouble or distress the customer experienced and what he or she is expecting to receive in return. Remaking an order the customer wasn’t happy with. A refund for something that didn’t meet the customer’s expectations. A refund or credit when the customer was overcharged. A coupon or discount on the customer’s next order to make up for the inconvenience. An upgrade or a freebie to apologize for a long wait. In Alice’s situation, offering her a new meal with only gluten-free ingredients and refunding the purchase price of her previous order could be a good resolution. To alleviate any distrust she might be feeling toward your truck’s competence, you could offer to make the meal yourself so that you can double-check all the ingredients and look for gluten products. By making her a new meal and also refunding her order, you show Alice that her happiness is important to you and that you believe she shouldn’t have to pay for something that wasn’t exactly what she ordered. If you don’t know what a customer wants or what will make him or her happy, it’s okay to ask. Say something like, “How can I fix this for you?” or “What could I do to make up for our mistake?” Phrases like these show the customer that you are willing to do whatever you can to make sure he or she leaves feeling satisfied, and they can go a long way toward reestablishing a positive relationship between him or her and your truck. Once you’ve figured out what you can do to resolve the situation for the customer, go ahead and take that action swiftly. There’s no need to keep the customer waiting around even longer to have the mistake fixed, and a fast resolution shows the customer that you’re eager to correct the problem and set things right immediately. Resolving the situation is the most important step in the LEARN model of handling customer complaints, and it’s also the part that customers are expecting when they come to you with a problem. However, there’s still one more thing you should do before sending a customer who had a problem on his or her way. You need to take some action to nurture the relationship for next time. This step is one that can set your truck apart from your competitors (including other trucks and local restaurants that may not have very customer-friendly policies in place)—and it’s also incredibly simple and takes little effort on your part to complete. Before the customer walks away from your truck, make it a point to end the interaction on a positive note. Though resolving a situation for a customer is usually pretty positive in and of itself, the act of something like refunding a credit card and sending the customer on his or her way can leave a slightly sour spin on the whole experience. It’s up to you to find some way to brighten the situation before the customer leaves. Apologize again and let the customer know that you appreciate the problem being brought to your attention. Explain what you’re going to do to make sure similar mistakes don’t happen in the future. Summarize what you did to resolve the situation and ask the customer directly if that resolution left him or her feeling satisfied. Ask if there is anything else you can do to improve the customer’s experience. By making the effort to end the interaction on a positive note, you can stabilize the situation and show the customer that you want to move forward from here. This simple final step allows you to nurture your relationship with the customer and promotes goodwill in the future. It makes the customer feel better about what happened, shows how much you care, and also increases the chance of your customer returning again. Though you can’t please every single customer, you can turn most negative situations into positive experiences by focusing on each step of the LEARN model and doing your best to address your dissatisfied customers’ complaints. Listening to your customer, empathizing with his or her plight, apologizing for your truck’s mistake, resolving the situation, and taking steps to nurture the relationship for next time shows customers that you are committed to delivering excellence—and that you will always put their needs and happiness first. Coming up next: If customer satisfaction is your top priority, you’ll love next week’s lesson! We’ve got some fantastic promotional ideas you can use to keep fans happy and coming back for more—stay tuned for this special chapter. In the meantime, we’d love to hear about how you’ve resolved customer disputes in the past. Do you have a foolproof strategy for listening and apologizing? Have you found another creative way to resolve situations where the customer is unhappy? Share your best tips with other FoodTruckrs in the comments below or on our Facebook or Twitter pages!